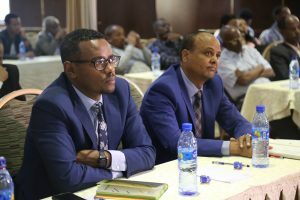 On March 18-19, 2019, the Ethiopian Mining Council met with a wide range of stakeholders to provide feedback during a consultative meeting on the draft Mining Policy. The consultative meeting, officially opened by H.E. Mr. Assefa Kumsa, State Minister of the Ministry of Mines and Petroleum of Ethiopia, discussed extensively the huge potential of the mineral sector to transform the country’s economy, as well as the major challenges facing the sector. The draft policy aims to clearly articulate the potential contribution of the sector to the country’s growth and transformation, and how best to harness the benefits the sector could deliver. Through the consultation, the main challenges identified were: absence of cross-sectoral inter-linkages, reduced investment, lack of value addition, insufficient awareness on the importance of the sector, and lack of access to organized data. The draft Mining Policy will be further enriched by incorporating comments and feedback received from stakeholders before being tabled for the Council of Ministers’ approval at the end of April. The overarching goals are to contribute to the country’s sustainable development and bring about structural reform to the overall sector. Once ratified, the Mining Policy aims to boost revenue and to generate additional employment opportunities by encouraging and attracting investment. The Supporting the Ministry of Mines in Ethiopia project is designed to strengthen the capacity and organizational management of Ethiopia’s Ministry of Mines, Petroleum and Natural Gas at operational and strategic levels. The ratification of the new Mining Policy will contribute to achieving one of the project’s overall objectives – to improve resource governance and support the long-term management of a sustainable mining sector in Ethiopia. CIRDI is proud to closely partner with the Ministry of Mines and Petroleum in this important undertaking.